Münster was the first city to create this comprehensive ecological concept in 1966, which has had a decisive influence upon urban development. Due to the structure of the city – a city centre with suburban city areas and a landscape area that amounts to virtually three quarters of the city areas – Münster recognised at an early stage that the systematic development of this significant potential is necessary. The Green Spaces Ordinance of Münster that has been constantly further developed to this day forms a reliable basis for politics and administration when decisions concerning the development and use of green spaces are at stake. The Green Spaces Ordinance guarantees that the ecological and climatic qualities of the city shall also continue to be preserved and are extended in the future. It ensures the development of green, leisure time and recreational spaces and the extensive provision of playgrounds, allotments and cemeteries. In addition as an important contribution towards the space usage plan it provides a basis for making decisions as to which free spaces must be retained at all costs due to their importance for the city and which spaces can be provided for the development of settlements, e.g. for new business estates or residential areas. 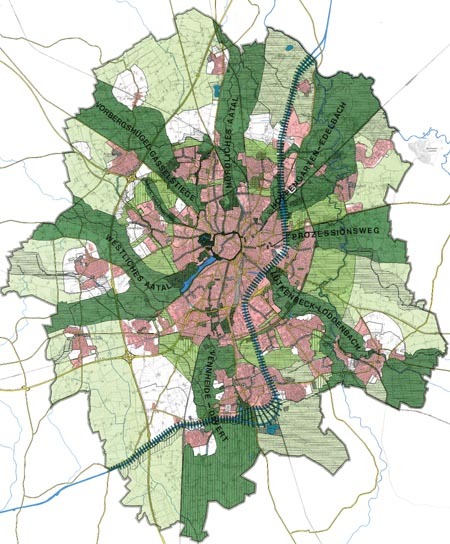 The Green Spaces Ordinance of Münster defines a green system consisting of three green rings and seven green corridors, which run towards the city centre in a radial manner from the open countryside. In addition the Dortmund-Ems canal runs through the city area and provides a special "maritime" area of potential due to its proximity to the city centre. This green system ensures fresh air throughout the entire city. 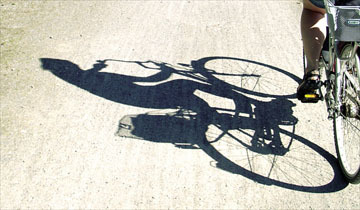 In addition people can access the extensive range of recreational areas and open countryside by means of a united network of cycle and footpaths. 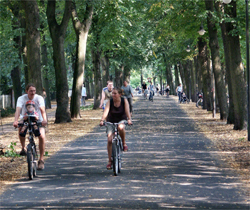 The car-free Promenade is a four-row ring of limes around the Old Town, offering cyclists, joggers and walkers a good connection. Münster has a united green ring around the city centre, which hardly any other city can lay claim to on this scale, due to its Promenade. The Promenade that is 4.5 kilometres long forms the heart of the green system. It came about as garden grounds from 1764 onwards in accordance with the plans of the Baroque master builder Johann Conrad Schlaun following the razing to the ground of the medieval fortifications. It is now an outstanding construction, soil and garden monument due to its green and water spaces. The four row ring of lime trees with the former fortifications integrated within the landscape gardening design simultaneously constitutes a connecting link between the Altstadt and the adjacent city centre. Every day the green ring offers thousands of people solitude and relaxation in the heart of the city and the way is clear for cyclists on the cycle paths. The Wienburg park offers people recreation and relaxation right on their doorstep. The second green ring comprises the free space between the city centre and the outlying city districts. It connects the green corridors on the fringes of the city centre with one another, acts as a climatic ring and secures the connection to the Münsterland park landscape. Twelve individual landscape areas, which comprise landscape parks and other parks, are located within the second green belt. The types of parks have been consciously brought in line with the conditions of the natural landscapes. 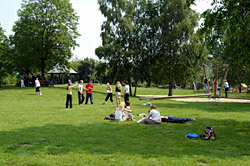 Whilst the landscape parks have characteristic elements in the style of the Münsterland park landscape, the other parks have numerous facilities for games, sports and recreational activities. 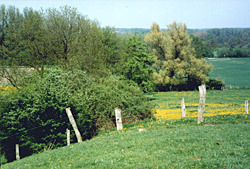 Meadows, hedges and tree rows are typical features of the Münsterland park landscape. The third green ring comprises extensive landscape areas on the fringes of the city and thus secures the ecological landscape conntections. The Münsterland park landscape is a cultural landscape of structural richness due to its cultivation by farmers, with structuring hedges, meadows, fields and forests. It has a large degree of structuring and recreational value and is also characterised by a lot of diversity of species. 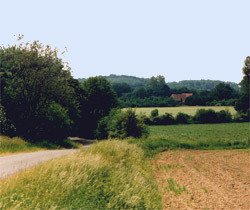 A connection is established with the wide-ranging recreation landscapes on the Werse, in the Aatal (Aa valley) and on the Vorbergs hill by means of seven green corridors. Based on the natural features and historical path connections, they develop into a green wedge from the open countryside into the city centre. The "Westliches Aatal" ("Western Aatal") green corridor is an ideal example of this, consisting of the Aasee (Aa lake) recreation area spanning more than 40 hectares, which is directly linked with the Promenade ring. The lake also assumes a central role to ensure a pleasant city climate due to its large water surface and its south westerly location. Additional areas of countryside protrude well into the city centre from outside and provide recreational experiences and experiences in the natural countryside that are just a short distance away.